Tazza D’Oro Sending Pennsylvania Apples to Olympia – Why? Last week, Heather, from Batdorf and Bronson, after a visit to the Olympia Farmer’s Market and on the heels of Scott Merle’s “Expand Your Palate” article in Fresh Cup, came up with the brilliant idea of having a Washington State apple tasting for the folks at B&B – check out the blog. I call it brilliant because we are always looking for ways to expand our palates and what better way than to taste and experience the local foods of the season. I emphasize the local thing here because an apple picked when it’s ready versus picked weeks in advance tastes very different – yea, it tastes like a real apple! This past Friday, I called Tim from Kistaco Farms to put an assortment of local PA apples together so we could send them to Oly. Tim choose Idared, Stayman Winesap, Macoun, Northern Spy, and McIntosh. 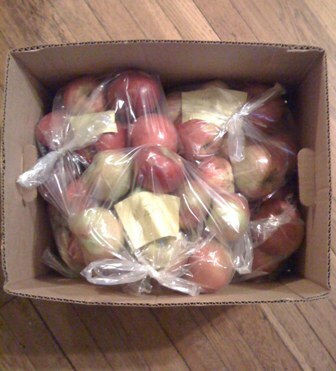 I picked up the apples on Saturday and hopefully these fresh, ripe PA apples will make it to Olympia in good shape. Happy tasting B&B – we are excited to hear your results and to see if there are any differences in our apples compared to your local apple varieties. PS – Heather, you may want to open the box quickly because at the last minute, a nice Wheaten Terrier may have squeezed himself into the box! HA! I can't wait for the apples... but can I send the Wheaton back if he gets into trouble? 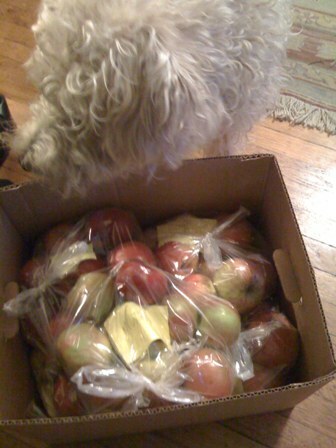 We got the apples - sans Frankie ;)! Thank you Amy!!! They are out in the lunch room for people to taste and comment on. My favorite so far is the Northern Spy - nice acidity! McIntosh is sweeter than I imagined it would be. Thanks again - you are so good to us.